888 Holdings is well known in online gaming for running the largest online casino company in the world, but the poker side of their business is noteworthy for seeing dramatic growth in the last year. This review presents some information about the business side of their enterprise, then follows up with more specific analysis of the various aspects of their poker-specific enterprise. 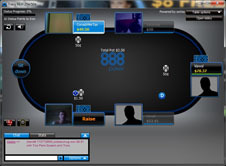 888Poker (www.888poker.com), formerly known as Pacific Poker, was founded in 1997. They rebranded as 888Poker in 2002. The company that owns 888Poker, 888 Holdings, is registered in Gibraltar, and it’s been traded on the London Stock Exchange under the symbol “888” since 2005. In 2011, eGaming Review awarded them the Poker Operator of the Year award. 888 now sums up its poker business strategy in three words: “We play different.” Concrete examples of the “We play different” strategy include the site’s new single click beginners lobby, 3D graphics, video tutorials, webcam poker tables, and team tournaments. This strategy has resulted in a 122% increase in the number of players on their site during 2011. The site is available in 22 different languages in 176 countries worldwide, but the poker software is only available in 14 of those languages. 888 Poker stopped accepting real money players from the United States in 2006 after the passage of UIGEA. Multi-tablers like the 888 Poker software, as they’ll be able to play at up to 16 tables at one time. 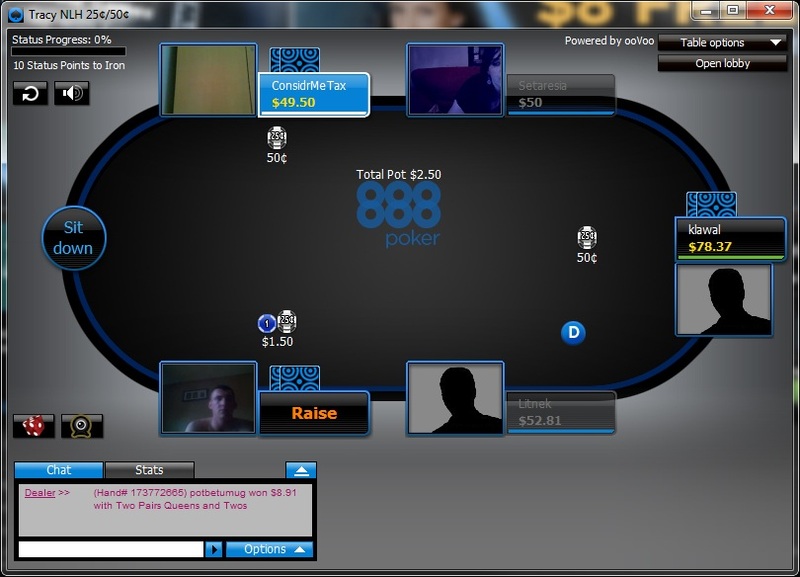 The 888 Poker software also includes replay functionality. With the click of a mouse, players who want to see how a hand played out can watch it again. It also offers all the standard functions of any top poker site such as 4 colour decks, auto-fold buttons and the ability to bet certain %s of the pot without having to manually type everything. One of the best things about 888 Poker is they offer two great options for all their players. The 888 Poker download is only available to Windows users. However, users of non-Windows systems are not forgotten about. 888 Poker for Mac and 888 Poker for Linux is available via the 888 instant play software. 888’s no download client is played in any web browser. All you need to do is navigate to the 888 Poker website and login there. Windows users who prefer not to download the software can also play using 888 Poker’s flash interface. The flash functionality isn’t as robust as the downloadable poker client, but it’s fast and reliable. 888 Poker offers so many promotions that a poker player needs a hefty calendar to keep up with everything. New players are eligible to receive $8 as a no deposit signup bonus, which means players can get started at 888 Poker without risking any of their own cash. Besides the deposit bonus, new depositing players are eligible to play in multiple freerolls. The First Depositors Challenge is a $100k guarantee tournament held every Friday at 20:00 GMT. The top 10 players in that tournament each get a seat in the Sunday Challenge, which is a weekly tournament with a $100k guaranteed prize pool. First time depositors also get 7 free entries to daily $500 Depositors Freerolls, and they get an entry into a single $1000 Depositors Freeroll. One of the more interesting promotions running at 888 Poker right now is the 888 Genie, who is an actual 888Poker employee who visits the webcam poker tables with mini-games for the players to play. Besides offering mini-games, she awards cash and prizes. 888Poker also offers frequent opportunities via qualifier tournaments to win seats in offline poker tournaments like the World Series of Poker, the Asian Poker Tour, the Aussie Millions, and the Irish Poker Open. 888 Poker offers a wide variety of deposit and withdrawal methods, many of which are tailored to specific countries. These deposit methods can be as prosaic as Visa or Mastercard, or as unusual as Skrill (which specializes in gaming transactions) or Commerzbank (which specializes in transactions for German citizens.) Withdrawals are available via multiple methodologies too, the easiest and most common being wire transfers and bank drafts. 888 Poker offers a standard selection of games, including the ubiquitous Texas hold’em. Other games offered include Omaha, Omaha hi-lo, seven card stud, and seven card stud hi-lo. 888 Poker often sees over 10,000 players online at any given time. Texas hold’em players will find plenty of tables, both full and short-handed, at a wide variety of limits. Omaha players will find a good selection of tables, but not the same wide selection that’s available at the Texas hold’em tables. Stud players will find a more limited selection. Since 888 is a casino brand, the tables often have a lot of soft players who have wandered over from the casino games. Most of these fish will be found schooling at the Texas hold’em tables. Expect to find slightly more serious competition at the Omaha and stud tables. Players looking for mixed poker games or draw poker games will be disappointed. 888 Poker sticks with the standard, most popular poker games listed above. One of 888 Poker’s distinguishing characteristics is its aggressive marketing approach. This becomes obvious the first time you visit their site, where you’re greeted with an immediate pop-up ad encouraging you to visit their Facebook poker game. If you leave the site without signing up, you’re presented with another pop-up window explaining that 888 Poker is one of the top three poker rooms on the Internet, and asking you if you’d like to ask a live operator any questions before you go. Some people are turned off by aggressive marketing, but this strategy has advantages and disadvantages for the online poker player. Companies which market themselves as aggressively as 888 Poker often provide more incentives to play more often than companies with a softer marketing approach. A look at the number of promotions and special offers at 888 Poker will make even the most cynical Internet poker player glad of this approach. Best poker site for new players. Free $8 no deposit needed. $600 Sign up bonus with deposit. Double or Nothing Sit & Gos. Listed on the London Stock Exchange. Not open to the US. VISA, MasterCard, Bank Transfer, CashUp, ClickandBuy, Chinese Debit Cards, Commerzbank, Deutsche Bank, eNets, EntroPay, Laser, NETELLER, Netpay, PayPal, Pay&Play, PayBox, POP, Postepay & Kalibra, Moneta, Skrill (moneybookers), WebMoney, Qiwi VISA Virtual, Ewire, Abaqoos, Boleto, Dankort, Diners, eKonto, GiroPay, iDeal, Nordea, PayPoint, P24, PaySafecard, POLi, Przelewy 24, SEB Pank, Sofortuberweisung / Sofortbanking, Swedbank, Ukash, FundSend, DineroMail, Bancaria Local, Citadel Instant, Instadebit, Multibanco. English, Español, Български, 简体中文, Čeština, Dansk, Nederlands, Français, Deutsch, Magyar, Italiano, 日本語, Polski, Português, Română, Русский, Svenska, Ελληνικά, Cрпски.